Today while driving back home, on the Western Express Highway, near Vile Parle, there was this Toyota Qualis ahead of me which had a message saying "It's better to lose some minutes in life, than lose a life in some minutes!" I immediately took a picture with my BlackBerry, but it came out too grainy. In the anxiety to reach our destination we end up speeding and driving rashly. Sometimes, we end up using the mobile phone while driving. Not only are these actions distracting, they can be hazardous too. And you never know what the outcome can be, which is better not thought about. 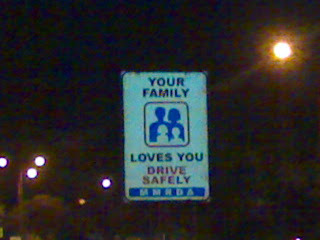 This reminds me of a signboard, again on the Western Express Highway, between Milan Subway and the airport, which reminds us to drive safely. How true, unfortunately, a hectic stressed life style has made us rash drivers. What we often don't realise is that rash driving might only give us an advantage of a few minutes, although in the process exposing us to great risks. The Delhi NCR is one region where you can find all sorts of drivers, and those who stand out the most are the rash drivers!